Lately I came across a book I would have loved to have written. The only difference is I would have written it in Welsh instead of English. About 18 months ago I wrote a drama for Theatr Genedlaethol Cymru about the Beasleys, and one of the most interesting things about the assignment was researching the politics of Wales in the 1950’s. It was such a formative time in the development of National feeling. This was the decade in which my parents married and started to raise a family. The memory of the Second World War was still very sharp and rationing remained in force. The Labour party was in Government at the start but by the end of the decade Macmillan had appeared with his slogan, ‘You’ve never had it so good’. Plaid Cymru was a small party; learned, civilized, familial, until the threat from the Liverpool City Corporation to drown the village of Capel Celyn presented the party with a stark choice. Was it to be a party of government or a campaigning national movement? The Welfare State was new. The Labour Party was considering if it should grant Wales a Secretary of State and some measure of recognition as a national entity. Across the globe, old prejudices were being vanquished: Rosa Parks was challenging apartheid in Alabama, and the young were insisting on their own identity through the creation of totally new music. Through novels you can learn much about periods in history. I remember reading the books of Alexander Cordell in secondary school and learning South Wales history – a history we were never taught. I remember thinking at the time what great films they would make. In Welsh I devoured the novels of Islwyn Ffowc Elis, and so learnt of the tension between the gentlemanly values of the old agricultural society and far more daring communist ideas It was a much more entertaining way to understand the arguments than absorbing the dry facts of the ‘Five Year Plan’ in history classes. But there was a clear division – the Welsh language novels dealt with a rural Wales whilst the English language novels dealt with the industrial south. I could not work out where the quarries fitted in. People would describe Arfon as a rural county, and yet in Dyffryn Ogwen, Dyffryn Nantlle and Blaenau Ffestiniog, the environment was clearly industrial. Despite spending seven years in Ysgol Dyffryn Nantlle, I never heard of the March of the Unemployed nor of the Great Penrhyn strike. If I had heard of these it would have kindled a spirit of pride. It would have allowed me to believe that radicalism belonged in this place and that protest was part of our inheritance. I don’t think I every heard the word ‘radicalism’ in school, let alone understanding its meaning. I remember when John Rees brought a book called ‘Revolution’ to school to sell to me it felt as if we were exchanging goods on the black market. Understanding between north and south Wales was laughable. Liverpool was familiar territory but Machynlleth could have been on another planet. A south Walian boy did join our class but no one understood his Welsh. His nickname was ‘Martian’. Not many of us visited Cardiff and we had no idea of the existence of south west Wales, apart from the fact that our patron saint came from ‘Tyddewi’ which was close to heaven. 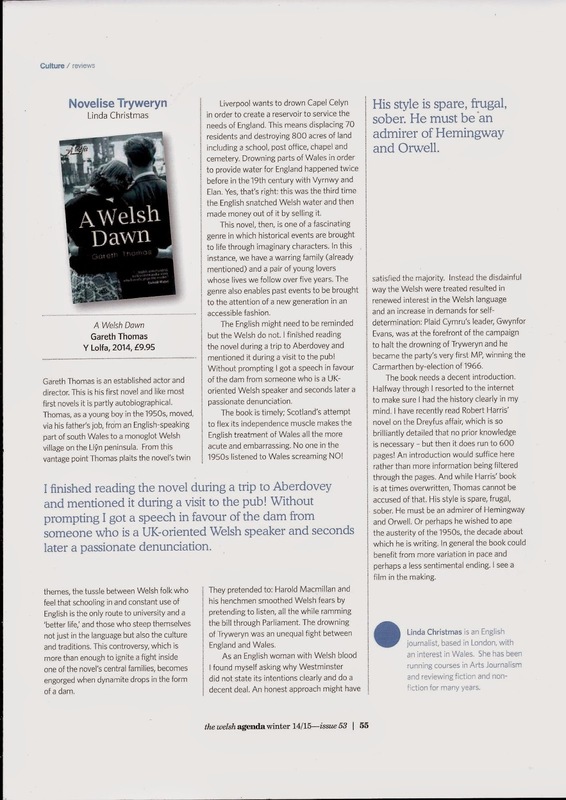 For these reasons I am pleased that Gareth Thomas, about whom I know nothing, has written the novel, A Welsh Dawn. Possibly its not a bad thing that it has been written in English. The novel is set in Dyffryn Nantlle, when Gwilym, ‘a new boy from Cardiff’ arrives in Ysgol Penygroes. There is an examination of the Welsh language through the eyes of a young non-Welsh speaking boy, and that it itself is new. It brings to mind the novels of Emyr Humphreys, although those focused on Plaid Cymru, whereas this book allows The Welsh Labour Party its space. Huw T. Edwards is a prominent character and I’m determined to find out more about Dafydd a Kitty Williams. I have a dream of the future – not too far away. When Siop Griffiths has re-opened (meeting to discuss that on July 10th by the way) and visitors are coming from everywhere to walk the pathways of the valley, there will be a book display in a prominent position. In amongst the works of the poets this valley has raised, there will be a place of honour for Gareth Thomas’ novel and a few signed copies for sale. But more importantly, down the road in Ysgol Dyffryn Nantlle copies of the book will be on the reading list of the Sixth Form. They will become aware of recent Welsh history. They will understand the industrial heritage of their valley and will learn of the March of the Unemployed. I do hope that’s a future which won’t be too hard to bring about. Reading this novel was like looking in a mirror. It made me feel as if I was reading my own autobiography, discovering something of myself in the various characters. In fact it is as if I had lived the novel. Call it déjà vu, call it evocation, call it reminiscence. I ended up with the weird feeling that I had been there before. In the main characters, Gwilym and Gwen, Dafydd, Ifan, Bryn and the other young people, I found parts of my past and facets of various acquaintances. Yes, I was taught in an all-Welsh school where the occasional English speaker seemed to have come from Mars. I still feel guilt for enjoying their awkwardness in attempting to grasp a strange language. I can still smell the cloying disinfectant in the outside toilets. And the underlying smell the disinfectant was meant to stifle. A Welsh Dawn is a story of growing up in the 1950s, my awakening years as a teenager. The tensions are all here. Stirrings of sexual awareness. The fate of the Welsh language. The drowning of Tryweryn. Direct action versus negotiation. The clash between heritage and materialism. Between young aspirations and those who are too resigned to strive for change. There is the north and south divide, Caernarfon and the Rhondda. Soccer and rugby. Yes, I’ve been there, done it and worn the T-shirt. The difference is that Gareth Thomas says it so much better than I ever could. It would have been easy for a story of such contrasts to become clichéd and hackneyed, with the main players becoming no more than cardboard cut-outs. But no, every character is skilfully crafted and well-rounded. And the main events as well as some of the characters are based on reality, involving actual people such as Huw T. Edwards and Henry Brooke, Emrys Roberts and Gwynfor Evans. Such a mixture of fact and fiction has demanded much detailed research. Yet the author has avoided a mere re-hash of recent Welsh history. Fact and fiction are interwoven seamlessly, so much so that it felt as if I was learning of those political events for the very first time. In a postscript, the events of the 1950s are put in context. 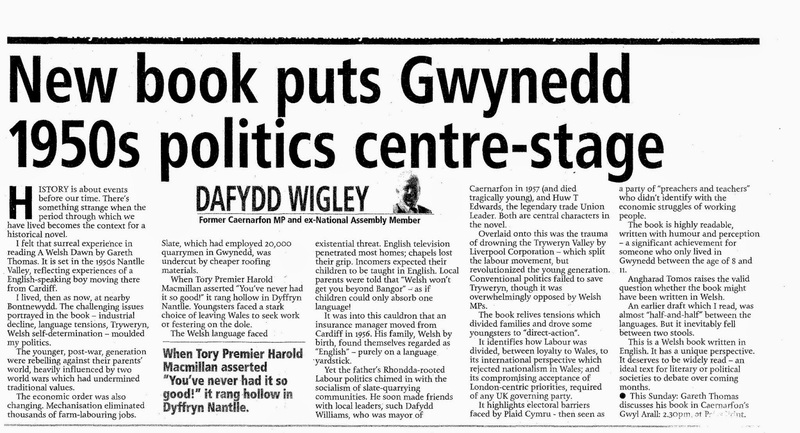 We are reminded of the important subsequent milestones between 1959 and 1999: the Beasley’s relentless fight for their linguistic rights, the formation of Cymdeithas yr Iaith Gymraeg, the appointment of a Welsh Secretary of State, Gwynfor Evans’s electoral success and the first convention of a National Assembly for Wales. This is an epic novel in every sense of the word. In it I rediscovered parts of myself. 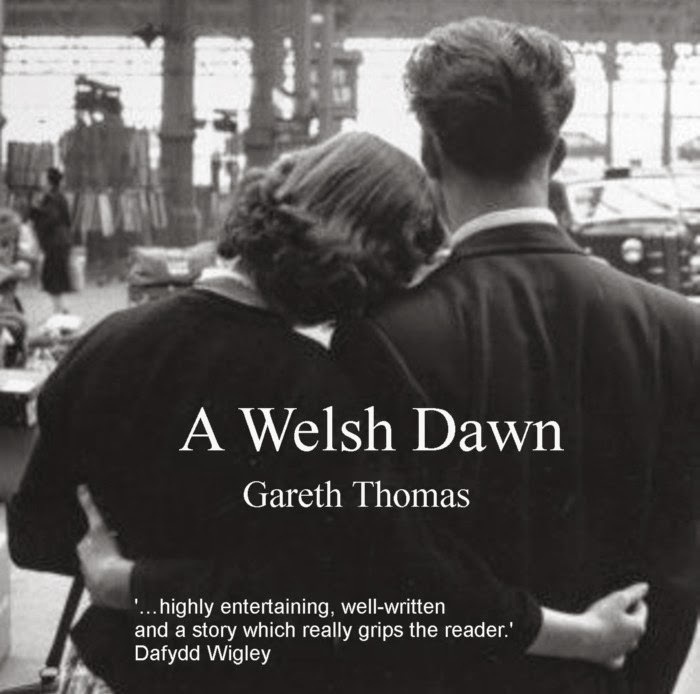 Gareth Thomas’s A Welsh Dawn is set in the late 1950s during a period of Wales’s emerging rejuvenation as a distinctive political force, with nationalist and socialist opposition to London combining together and growing in potency. Author Gareth Thomas explores this rising confidence and the duplicitous Establishment response to it on two different but mirrored levels. From the wide-angled perspective, he explores the patient but herculean efforts of the Council of Wales to persuade the Tory administrations of Anthony Eden and Harold Macmillan to accord Wales some measure of limited autonomy. The fight for the Welsh nation’s control over some aspects of its people’s lives is galvanised by Parliament’s approval to flood an entire village and its surrounding farmland to supply water to the Labour-controlled Liverpool Corporation led by Bessie Braddock. Their lack of solidarity and empathy with those affected shows that it wasn’t just English Tories who were the problem. The author goes to great pains to incorporate all of the major players on both sides of this protracted political battlefield, combining their actual recorded words with imagined conversations true to their known respective values and personae. All the exchanges are believable and not dragged down by heavy-handed verisimilitude. So we encounter the authoritative trade unionist Huw T Edwards, Welsh Labour MPs such as Goronwy Roberts and Cledwyn Hughes, torn between party loyalty and their empathy for the rising aspirations of their constituents, as well as Plaid Cymru greats such as Gwynfor Evans and Emrys Roberts. Thomas seems to garner most pleasure, though, from the portraits of their bourgeois foes, the faux-simple but utterly underhanded Tory prime minister Macmillan, the slimy but avuncular Henry Brooke and their whole ghastly and elitist Civil Service. On the personal level, the book considers how these tensions and hopes play out in the fictional person of Ifan, a young man from a small village near Caernarfon. To the annoyance of his ambitious mother, Ifan opts to read Welsh at Bangor University, where his consciousness is raised by encounters with both local and overseas students fighting imperialism. Slowly, as the extent of English delaying tactics becomes clear both in terms of saving the threatened village and the wider political demands, Ifan is drawn towards more direct action. Overlapping the narratives of the political giants on the one hand and Ifan and his family and friends on the other is the persona of Dafydd Williams, an engaging socialist lawyer, visionary and Mayor of Caernarfon, who quite literally works himself to death in the service of his people. It is in Williams that the author provides us with the epitome of, and a tribute to, those hundreds and thousands of working-class Welsh whose determination subsequently won them greater control over their own affairs. 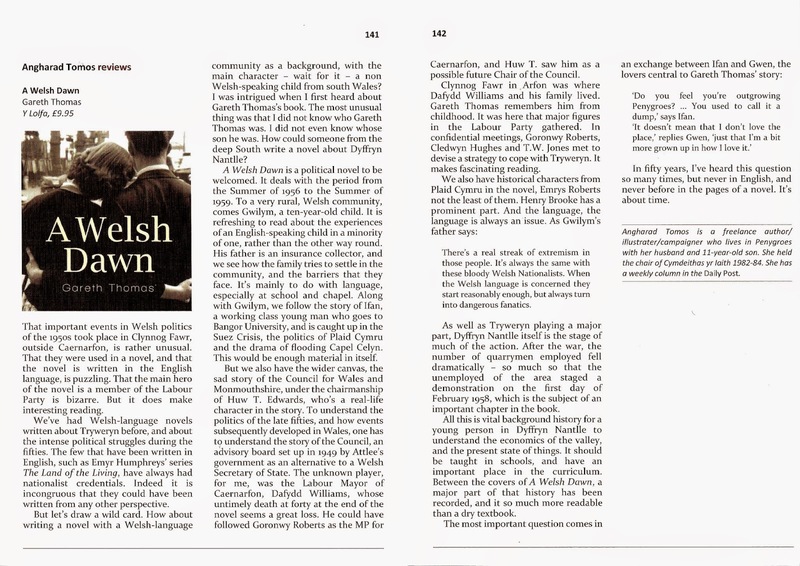 A Welsh Dawn is yet another quality novel from the always excellent Y Lolfa, which has established itself as a publisher of works that are deeply Welsh but which also resonate far beyond that nation’s geographical and cultural boundaries. This review deserves to be written in Welsh. Unfortunately I am still struggling with this very foreign language. This book focuses on the period when all the separate and disparate elements of Welsh Identity began to come together. It is when the aspiration to be a nation grew and for Wales to no longer be counted as just other counties of England far from London. The warm simplicity of the love story that binds this story together is in contrast to the deep seated conflicts of a nation divided by three languages (English, North and South Welsh), geographic and historic differences, political and economic ideals that are here so clearly defined. The fiction fleshes the bones of history to make it accessible and understandable to all. I am pleased that it was written in English. As an Englishman having retired to Wales it has helped my understanding of and feelings for recent Welsh events. I don’t think that I will ever be able to feel other than an outsider until I can understand what is said to me in Welsh. It is the problem of language use that is so well expressed through this story. I don’t have to learn Welsh to live in Wales. English is perfectly adequate for all but the rarest occasions. Learning in South Wales has its difficulties as it seems most of the literature is written in the north. But it is the knowledge that the tradition of poetry, song and story is closer to everyman in Wales than in England, where it seems more academic. The sparkling clarity of the narrative is enriched by the Welsh dialogue (most of which I was surprised to understand. My eye is a better Welsh learner than my ear.) It is through Twm and his love of verse and the Welsh landscape is part of the root of Welsh Identity. The inclusion of Welsh poetry solidly grounds us in Welsh tradition. This is the core that most Welsh could possibly agree on. “Hiraeth” that unique many meaning word, a yearning for something possibly unattainable underlies the Welsh character. This story describes the dawning that may be it is attainable and worth striving for. Cenhedl heb iaith, Cenhedl heb calon.